Every acupuncturist has favorite points that they like in specific circumstances. Many times these points are "quick fix" types of points that have broad application and can be used following various rules of thumb, rather than a detailed diagnosis. Some of these points can be added to warm up and stretching routines to help the body prepare for training. While there are many points that can be used to relax local tissues, the ones included in this list all are all broad in application. These points are also in readily accessible spots on the body, making self-treatment possible. Note that all the points listed are bilateral, and found on both sides of the body, even if only one side is illustrated. This point is specific to relaxing all the tendons and ligaments within the body. This point is particularly good to rub on a regular basis if you have a history of joint strains, sprains or surgical repair to a joint. Gallbladder 34 is located anterior and inferior to the head of the fibula. The best way to find this point is to scrape the small finger blade of your hand up the side of your leg above the lateral ankle, until it comes to a stop, just below the side of the knee. This point responds well to hard pressing and rubbing. Go by what feels better to you. This point relaxes and strengthens the lower back. It responds well to strong deep pressing. 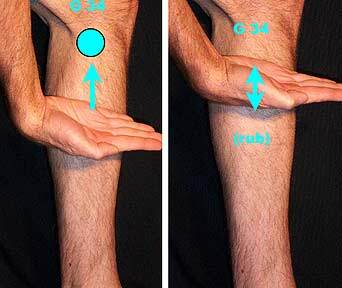 The point is in the center of the back of the lower leg, inferior to the belly of the gastrocnemius muscle. It is approximately at the point where the Achilles tendon attaches to muscle. Massaging the entire area around this point can be helpful for relaxing the backs of the legs, from the lower back to the heel. Many shoulder, neck and headache issues are the result of tension in the trapezius muscles. 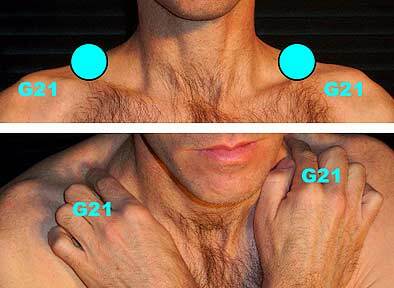 Tension in the trapezius will affect the movement of the entire upper back, neck and shoulders. 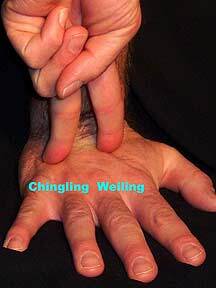 This point is very powerful in relieving stress and tension that affects these areas. The point is located in a triangular shaped hole at the top of the shoulders, half way between the neck and the acromion (shoulder bone). The best way to use this point on yourself is to cross your arms and press your middle or index fingers deeply into the top of the shoulder. This point has a unique feel or ache when pressed that is different from the surrounding tissue. Generally people know it when they have found it. There are of course many points that can be helpful in stretching, or compensating for old injuries and weaknesses. The above points are very general in use. If you have specific concerns, it is helpful to consult an acupuncturist as to the acupressure techniques that would make the most sense in your situation.